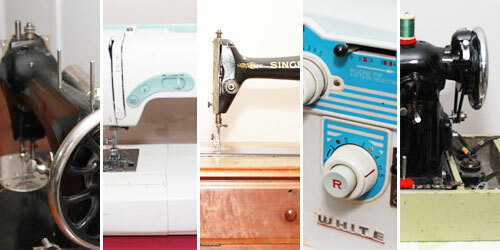 My Singer 301 sewing machine has become my favourite sewing machine for piecing quilts. 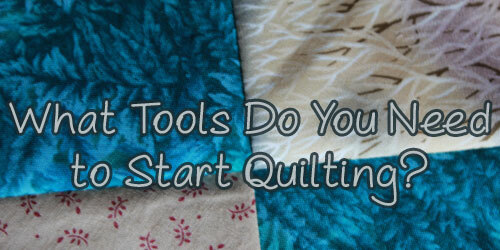 It’s one that I would recommend to any quilter looking for a solid straight stitch machine. Fresh from the thrift shop, a little grungy and dirty, but still charming. I never really sought out the Singer 301 – it wasn’t on my list of must-haves. I had read great things about the machine, but I didn’t think that I actually needed to seek it out because I had machines that could do the same things that the 301 could. So why did I add this machine to my collection? 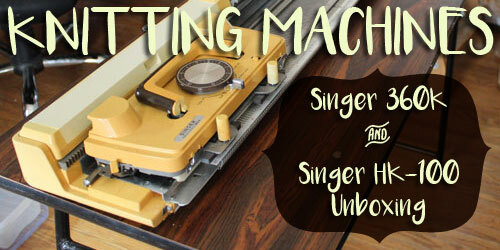 I wrote a post recently about my two Singer Featherweight machines. My first Featherweight was missing some parts, including the bobbin case. Whenever I go thrifting for sewing machines, I always look inside to see if there is a bobbin case included because they tend to get lost over time. 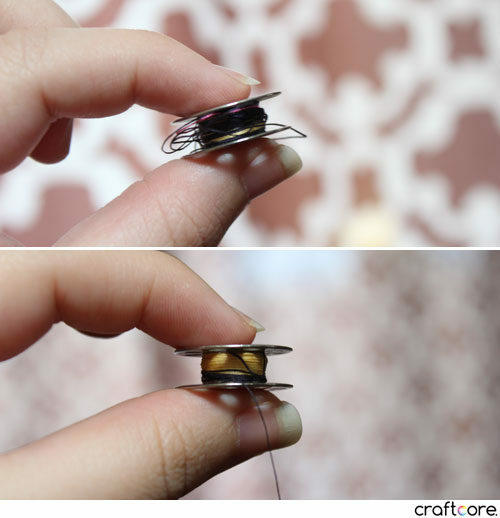 Bobbin cases can unfortunately be quite pricey for such a tiny piece of metal! I came across the Singer 301 while thrifting at a deal of a price. The Singer 301 and the Singer Featherweight share the same class of bobbins, so the bobbin case can be swapped between the two machines. 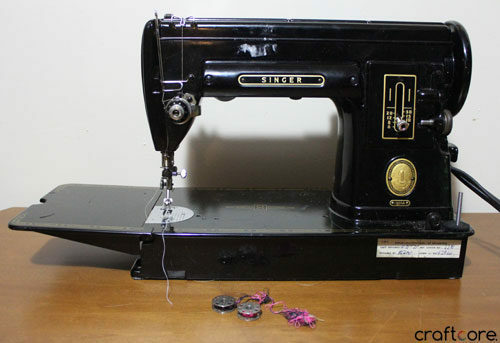 I actually picked up the Singer 301 cheaper than what I could find a Featherweight bobbin case, so it was like I got the Singer 301 for free! The machine is portable. 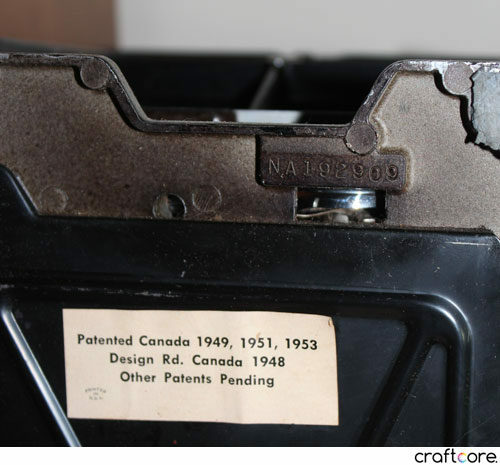 Unlike other machines from the time, the 301 actually has a built-in carrying handle, not just a handle on the case. It’s a light weight machine, weighing about 16 lbs, which is much lighter than most other machines at the time. However, it still has a base that can be set into a cabinet. It’s the best of both worlds! The machine uses a slant shank system, meaning that needle bar comes down at an angle towards the front of the machine instead of being perfectly vertical. Slant shank machines have their own specific feet and attachments, so you can’t share your low-shank or high-shank feet from your other machines. The slant needle makes it a bit easier to see what you’re sewing as you’re sewing it. The motor, light, bobbin winder, etc, are all encased in the machine. My favourite part: it stitches fairly quietly, almost a purr of a whir. It feels smooth to use. It took me a while to get this machine in working order but there were no major problems.. There were issues with tension but eventually I was able to get it to output a perfect stitch. 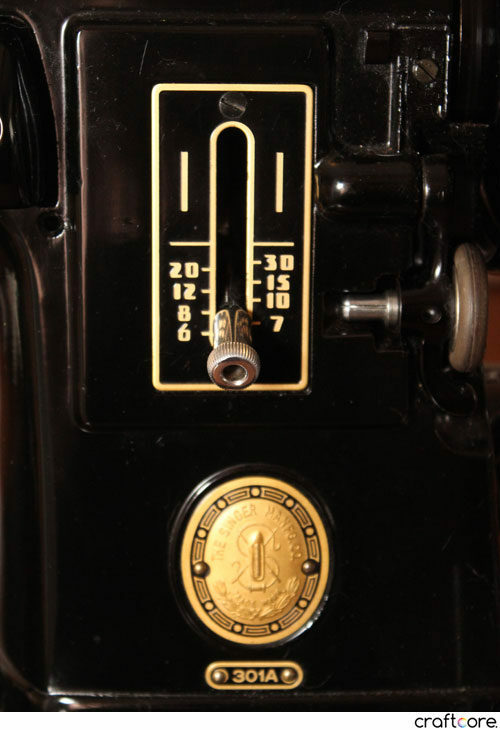 I like that the stitch length lever is clearly marked and has the ability to be reversed. 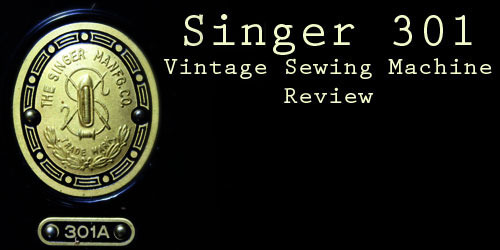 My Singer 66, for example, has an unmarked dial so you have to play around with the dial before settling on a stitch length. The 301 can be switched from one length to another with ease. I removed a price sticker from the head of the machine, but I decided to leave the repair sticker pictured above from the base of the machine. 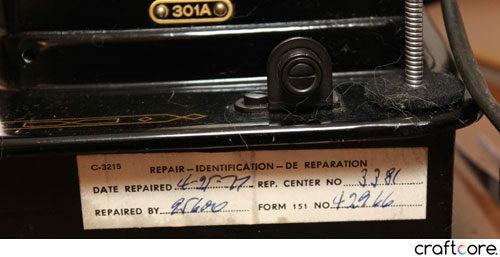 The previous owner got the machine repaired in 1977. I feel like this sticker adds to the machine’s history. My Singer 301 came with two bobbins. They were wound with thread already, and when I unwound them to replace with a full bobbin of black and white thread respectively, I found multiple colours of thread hidden inside. Many of my other vintage machines had bobbins with multiple threads. It was a common practice, done as a way to conserve thread. I don’t think I would personally have the foresight to be able to plan when I could go back to one of my hidden colours. I’ve since purchased more bobbins so that I wouldn’t need to worry about not being able to match my bobbin thread to my primary thread. I have fallen in love with this machine, so the next step on my journey with the 301 is to accumulate more slant shank attachments. I have the standard foot and the quarter inch seam foot so far. 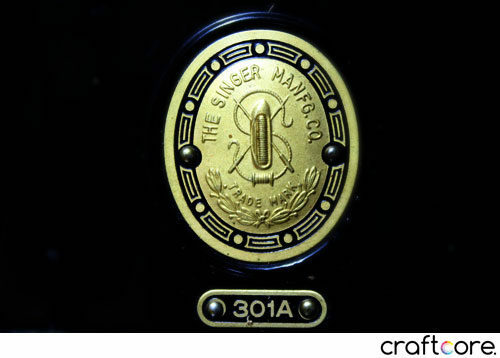 Do you have a Singer 301? Share in the comments below! 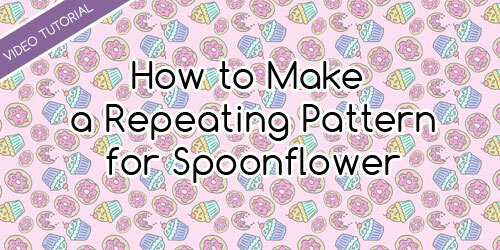 Thanks for the information about sewing! I have wanted to learn how to sew for a long time now, and I am finally going to give it a shot. Thanks for the tip about getting plenty of sewing pins and a pin cushion. That will be the first thing I invest in! 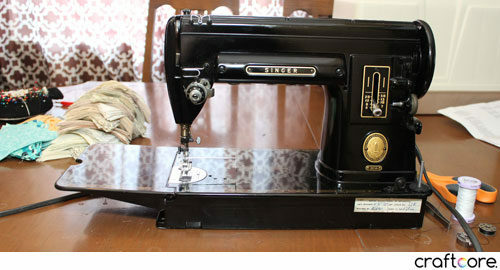 Hi I have a singer 301A. I inherited it when my dad passed. I kept it put away till recently. I took it out and fired it up. After resetting a few things I got it running perfectly. It’s a great machine. I cant wait to use it to make Halloween costumes this year. Witch is very soon. Lol.